The Funky Felter: The Crispness of a Fall Day . . . and some interesting Etsy finds! The Crispness of a Fall Day . . . and some interesting Etsy finds! I know that it has technically been Fall now for a little while, since September 22nd, but yesterday was the first day that it truly felt like Fall to me here in Kansas City. I actually got to wear one of my great vintage finds, a bright green mohair/nylon blend sweater. I was very excited for the cool, brisk air and calming wind. It was such a great Fall day, and today has shaped up to be the same. I even mowed the back yard early this afternoon with a jacket on. Ahh, gotta love Fall! It also made me want to browse for Fall items on Etsy. 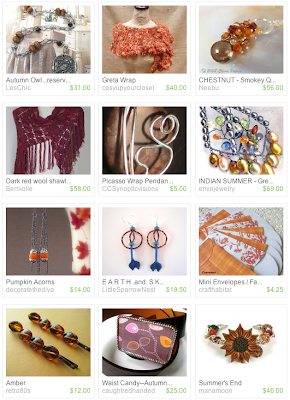 I did a few searches before I came across this gorgeous array of items when searching for "brown orange wrap" - go figure! Sometimes you come across a search page that could really be a treasury page of its own. I just wanted to share it with you and celebrate Fall today. Also, I wanted to let you know that my monthly October newsletter will not be coming out until this Friday, the 3rd, so you still have time to sign up! It is a once monthly newsletter that contains the latest felting news, indie business tips, and shop promotional discounts. It is a separate subscription from my daily blog posts. If you'd like to receive it, please go to my newsletter sign up page for all the details and to sign up. Also, your email info will not be shared nor will you be spammed. The subscription is only to receive my monthly newsletter and the occasional promotional or event announcement.